Simchat Torah takes place this week, which means that the Jewish annual Torah reading cycle is about to restart. 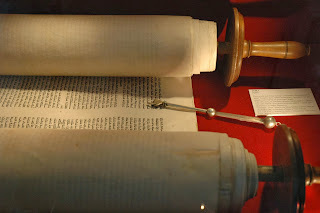 In Jewish tradition the Torah is divided up into 54 sections which are read throughout the course of a year. Even if you're not Jewish you might consider spending a year tracking along with the weekly readings. If you're a student of ancient literature, the Torah is an incredibly fascinating and engrossing anthology, and giving it a year of sustained study will be very rewarding. If you've studied Hebrew the weekly Torah portion is a great way to keep your reading skills sharp. If you're a Christian, the Torah/Pentateuch is the heart and soul of the Old Testament, and contains an interesting blend of texts that most of us are overly-familiar with (the Garden of Eden for instance) and texts that most of us have never touched (like just about all of Leviticus). This means that reading the Torah through the year will give you the opportunity to see familiar texts with fresh eyes and encounter unfamiliar texts perhaps for the first time. It's also a lot shorter than the "Bible in a year" reading programs many churches do. This tells you what sections to read each week. Resources on the weekly portion. This is a great basic overview of the Torah that gives attention to historical issues as well as the use and interpretation of the Torah in both the Jewish and Christian traditions. Affordable and accessible. I try to recommend this book or its more expansive brother as often as I can. Kugel gives us insights into how the earliest interpreters of the Torah understood it. This is a good introductory textbook on the Pentateuch. A newer book by Jon Levenson that explores Abraham in Genesis and in the history of interpretation of the three "Abrahamic" faiths. While Abraham is often represented as a common ground figure for Jews, Christians, and Muslims, Levenson shows that Abraham has meant different things to each of these traditions. A very interesting resource to accompany your reading of Genesis. The subtitle expresses pretty well what this book is about. The Bible as it Was is more of an anthology of primary text excerpts framed by some commentary and interpretation, while this book contains mostly commentary/explanation. A great companion to accompany your reading of Genesis. (If you haven't guessed by now, I'm a big fan of Dr. Kugel's work) A collection of essays on the early history of biblical interpretation, with most of the essays exploring the Joseph stories. Another great companion as you read Genesis. I'd love to organize a class at my church on the ancestral narratives in Genesis that uses Levenson's book (Abraham) and both of Kugel's books (Jacob and Joseph). This is the only commentary I'm including on the list. I remember the first time I used Childs' Exodus commentary I thought to myself: "every commentary should be this awesome!" It blends historical criticism with attention to theology and reception history. Mary Douglas' work has been influential in biblical studies. Here she brings her anthropological perspective to one of the more challenging books in the Hebrew Bible. I have not read this yet, but I have it on order. A progressive Rabbi's perspective on the relevance of Leviticus. Memory plays an important role in the Torah, as we see in Deuteronomy's call to "remember." This is an interesting exploration of Jewish social memory which might be a fun companion to your reading of Deuteronomy. I guess I do not have a good recommendation to accompany your reading of Numbers. Any suggestions?